B etsy Metz is the quintessential all-American gal! She is a well-educated and fiercely patriotic mother of four and a devoted and loving wife of her husband for 26 happy years. Her husband is also the all-American, being a college quarterback and a former Marine Corps Officer. Together as a family they want for nothing and by any standard have had an excellent and prosperous life. This life would be impossible in nearly any other country in the world and it is fair to say they are living the “American Dream”! Well, Betsy is a little different from the average American successful middleclass mum; “she cares” and “she acts” in the interest of her country, her family and the world. Betsy honours Truth, Justice and what she thought was the American way. The way of freedom, liberty and most importantly the way of courage – that is, the courage to face treasonous tyranny in her America! When Betsy started to see in 2003 that we had been lied to about the war in Iraq, she cared. When she found out through self-education 9/11 was a lie in 2006 she really cared a lot and was compelled to act! Betsy began one of the most important individual efforts to raise awareness of the crimes of 9/11 we have seen in the world, period. With a smile and a determination to her use her affluence for good and not for the greedy pursuit of materialism she has single-handedly done more to preserve the American Dream she lives than any in her local community. She joins a very small group of men and women in America that can look themselves in the mirror and say, “I did my duty to preserve what gave me the blessed life I have had and I want for future generations”. Any one you ask about Betsy within the 9/11 Truth Movement says the same things – they love her and they know she can be counted on to produce the goods, time and time again! 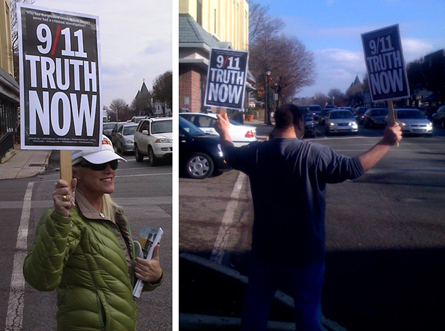 This month of March 2010 Betsy took us to another level with our quest for the pursuit of 9/11 Truth. I, on behalf of us all around the world, thank you Betsy, and the great American family that supports you. Bravo! Let our dearest Betsy be an example to the many of us that have benefited from freedom and wealth America gave to our world. Let’s do as she does and act now with all our means and with all our hearts to fight to expose the treason living large in America and within its empire. Betsy would like to thank all the attendees, speakers and helpers at the “Treason in America” event, and she says that she couldn’t have done it as well without the assistance and advice of event emcee, Jon Gold. Other interviews at 911visibility.com include Jon Gold, Dr. Stephen Juan, Richard Gage, Janice Matthews, Dr. Frank Legge, KBDI-TV Denver’s Executive Producer Shari Bernson, and more.